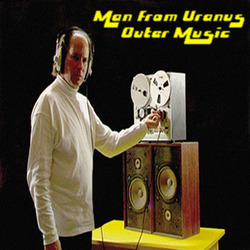 The first music made by Man From Uranus in and around 2003. The short nature of the tracks reflected early on my interest in creating ‘themes’ rather than songs. Eventually I would learn to make the themes longer. There’s a large use of Theremin on this album as during that time the Theremin was my main choice of instrument and I didn’t have many others. I later put the Theremin more to the back or didn’t use it all as I found the burgeoning ‘theremin culture’ quite tedious. I developed, as explained by the American radio DJ David Vessel on the track ‘Hit It’, a cut-off switch to the give the Theremin a staccato BEEP and I attached the cut-off switch to a plastic hat which I used as a ‘Beeper Hat’. When I press the button in the vicinity of the Theremin’s Electronic Field, loud blasts of noise would emit. Monsieur PP, a suave Thereminist of proper Theremin playing virtuoso repute, commented on the web how he could not imagine my Beeper Hat having any musical use. Beeps aren’t music. I went to his website and found a photo of Monsieur PP playing a private show for George Bush Snr, his friends, and their wives at the White House. That inspired me to make the track ‘Une Beepy Pour Le Creepy Monsieur PP’ in which MFU plays a special concert at the White House with special guests a singing orphaned camel and the surprise appearance of a Nuclear Trojan Duck.